If you are looking for a moderate designer price range without sacrificing the styles that you love, be sure to take a look at Serendipity clothes. We love this brand, and for great reason! The best part about the Serendipity designer is that they deliver a complete outfit for a great price. We love being able to offer this brand to our clients, knowing that they are always thrilled to receive their purchases. 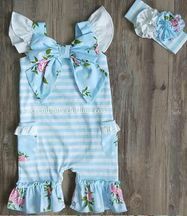 The adorable designs play homage to that southern charm that we adore, filling their outfits with fancy trims and playful ruffles. It is no wonder that fans of this brand continue to come back to see what the new season releases include! Looking for more information on the items that we will have in stock for this spring? I�m here to spend a little time talking about these collections. 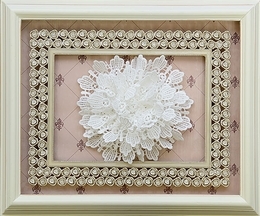 We love that the Southern Belle collection begins with a strong foundation of pink! Every belle loves her pink, and this collection will not disappoint. To coordinate with these rich shades, we find green and blue fabrics covered with beautiful florals! Add the ruffles and a matching headband and pair of leggings or shorts to every design and you have a winner! Whether you want something that looks fabulous for her birthday or a cute Serendipity outfit for your little girls all day play, we suggest placing these designs on your short list! If you love the sweetest designs when dressing your girls, then we have a collection we know you will love at first sight! This collection is called the �Love Birds� collection and we have to say that Serendipity has really outdone themselves. These clothes by Serendipity are centered around a darling print that features little yellow love birds. We love the way the yellow pops out from the pastel shades that surround it, just like the rays of sun on a partially clouded day. To liven up the look further, vibrant pinks in stripes and polka dots compliment the print. We love that this collection offers a matching sunsuit for your infant daughter, allowing you to match their look for everyday outings or a new family portrait. Continuing to be a favorite in the trends, hot coral is also found in its own collection by Serendipity for spring 2017. A light cornflower blue adds the perfect accenting color while coordinating floral print is often found in details or on her skirting. The dresses in this collection, as with the others, come with matching leggings, saving mom a bit of time in the morning looking for matching options. We love that these are trimmed with ruffles by the hems! Branching out of the shades of pinks, the final collection from Serendipity spring 2017 is the Secret Garden. This is one of my personal favorites because it holds the sweetest light lilac purple. The more casual designs in this look have comfortable light aqua blue tops paired with ruffled shorties. The simplicity of these looks are elegant in their own way and capture the eye with just a touch of ruffles and the bright colors.